please feel free to contact us for 40G QSFP ER4 40km Optical Transceiver,40G QSFP ER4 40km Transceiver,40G QSFP ER4 Transceiver. please contact us today. We will sincerely create and share success with all clients. 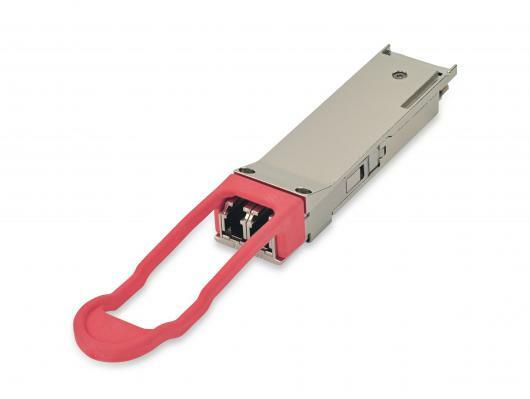 The 40G QSFP+ ER4 Optical Transceiver is a transceiver module designed for 40km optical communication applications. The design is compliant to 40GBASE-ER4 of the IEEE P802.3ba standard. The module converts 4 inputs channels (ch) of 10Gb/s electrical data to 4CWDM optical signals, and multiplexes them into a single channel for 40Gb/s optical transmission. Reversely, on the receiver side, the module optically de-multiplexes a 40Gb/s input into 4 CWDM channels signals, and converts them to 4 channel output electrical data. The central wavelengths of the 4 CWDM channels are 1271, 1291, 1311 and 1331nm as members of the CWDM wavelength grid defined in ITU-T G694.2. It contains a duplex LC connector for the optical interface and a 148-pin connector for the electrical interface. To minimize the optical dispersion in the long-haul system, Singlemode Fiber (SMF) has to be applied in this module. been designed to meet the harshest external operating conditions including temperature, humidity and EMI interference. "With our leading technology at the same time as our spirit of innovation,mutual cooperation, benefits and development, we are going to build a prosperous future alongside one another with your esteemed enterprise for 40G QSFP+ ER4 40km Optical Transceiver. The product will supply to all over the world, such as: East Timor,Tuvalu,Russian Federation. With well educated innovative and energetic staff we've been responsible for all elements of research design manufacture sale and distribution. By studying and developing new techniques we have been not only following but also leading fashion industry. We listen attentively to the feedback from our customers and give instant replies. You will instantly feel our expert and attentive service.